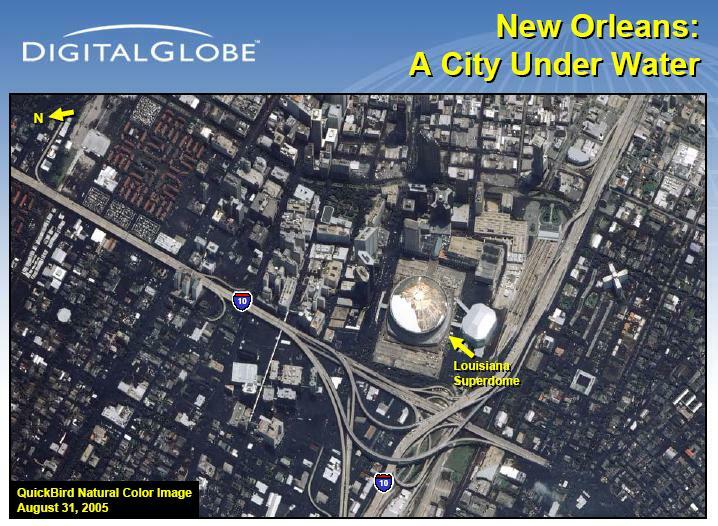 The Superdome, which was holding at least 10,000 evacuees, was surrounded by water on Wednesday, 31 August 2005. Evacuees sat tight in the massive sports arena, which itself bore Katrina's scars after having much of its outer dome ripped off the day prior. Evacuation plans called for the evacuees to later be evacuated via bus to the Houston Astrodome. The imagery below was collected by the Digitalglobe Quickbird satellite on 31 August 2005.